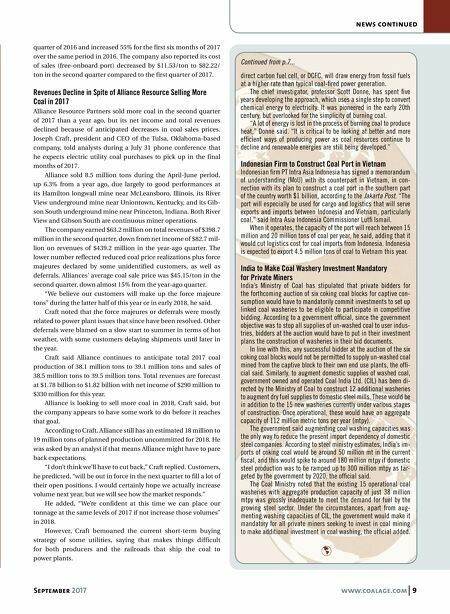 8 www.coalage.com September 2017 news continued d a t e l i n e w a s h i n g t o n Last month, two seemingly disparate events showed how some in the President Donald Trump adminis- tration are holding fast to promises and principles. Both events encouraged a respect for state partner- ship and the welfare of coal communities. The first event was a subdued birthday party at the Department of the Interior, where the Office of Surface Mining and Regulatory Enforcement (OSM) observed its 40 th anniversary. Recall that Congress passed OSM's authorizing law, the Surface Mining Control and Reclamation Act (SMCRA), in 1977, directing the agency to strike "a balance between protection of the environment … and the nation's need for coal …" In fact, a broader "balance" was also struck — between federal and state authority. Under broad direction from OSM, SMCRA authorizes state agencies to issue permits and oversee reclamation for every ton of coal mined. States also issue permits for legacy mine reclamation established under the law's Abandoned Mine Land fund. Coal companies not only do all the reclamation work — even on abandoned sites they had nothing to do with — but pay for the privilege. Not a bad deal for taxpayers. Not bad for the states either. With SMCRA, Congress envisioned a federal-state partnership. It wisely avoided the dreaded one-size-fits-all regulatory program, because in a continent-sized country like ours one size cannot possibly fit all mining regions. From the flat, arid plains of Wyoming and Montana to the rainy, mountainous Appalachians and the variety in between, coalfields differ greatly. Alaska is not Alabama even though both begin with an "A." In recent years, Washington lost sight of this fact. Coal states did not. At the birthday ceremony last week, Deputy Secretary David Bernhardt reminded OSM staff that "striking a balance" means working coopera- tively with state agencies. OSM has previously acknowledged that states do 97% of the oversight work but ignored this telling fact when it arbi- trarily changed SMCRA's basic regulatory requirements in 2015 without consulting them. That was the infamous "stream rule." It was one of the first regula- tions repealed by the Trump administration after the National Mining As- sociation (NMA) produced on-site data showing the devastating impact the rule would have had on coal supply. In the second event last month, the department rescinded a rule, finalized on January 1, that would change how coal mined from feder- al land would be valued. Recall that former Secretary Sally Jewell, now at mining engineering center Harvard University, fell for the activists' argument that taxpayers were being cheated despite contrary evidence from NMA members. They showed taxpayers were in fact benefiting quite handsomely from the federal coal program. Ignoring all this, the department set the value of coal according to the price of electricity and suggested equally irrational means for valu- ing coal sold in non-arms-length transactions — provisions that even department staff were uncertain how to apply. The valuation rule would have given the secretary sweeping new powers to impose another valua- tion method, maybe even a carbon tax. The additional revenue generated from "valuing" coal this way? Zero, concluded OMB. Support from the environmental lobby for this bouquet? Effusive. Small wonder coal-producing states — fearing the loss of more jobs and revenue from declining production on federal land — were con- cerned. They were relieved after Secretary of the Interior Ryan Zinke found the new valuation rule would "unnecessarily burden … domestic energy production." He pledged to replace it soon. This won't end the crusade against federal coal. Sen. Ed Markey (D-Mass.) promised legislation that would prevent the Department of In- terior from selling coal "at rock bottom prices to worsen climate change." 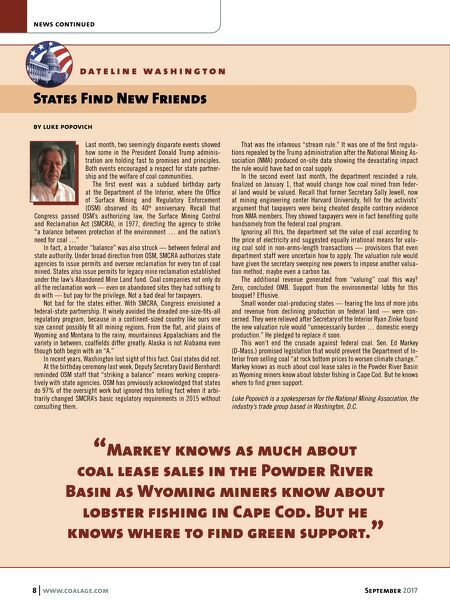 Markey knows as much about coal lease sales in the Powder River Basin as Wyoming miners know about lobster fishing in Cape Cod. But he knows where to find green support. Luke Popovich is a spokesperson for the National Mining Association, the industry's trade group based in Washington, D.C. States Find New Friends by luke popovich "Markey knows as much about coal lease sales in the Powder River Basin as Wyoming miners know about lobster f ishing in Cape Cod. But he knows where to f ind green support. "